Most of us try to be very organized. I know that because you girls have the best ideas. Well, I love to do lists but seriously they get lost all the time. 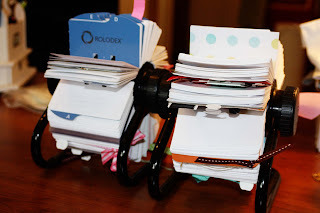 Taking my inspiration from Carrie at Blah, Blah, Blog, one of the blogs I love, she created an Idea Rolodex. Hers is prettier than mine but I didn't spend as much time on it. I actually have two rolodex. The one on the left, I use to organize all my phone numbers, to do lists and blog ideas. The one on the right, I use to organize my blog ideas in some sort of calender. These two little rolodex hold a ton of information and when I am finished with something on my list, I take the card out. I also have a running list of books I want to read, projects I need to work on and videos to watch. I prefer it to my iPhone because they are on my desk and remind me to look at them often. I don't think I have that many ideas. Maybe I'd better expand my mind. You are amazing! Great idea! I can't stand electronic to do lists or calendars. I need to physically write it down, color code it, and cross it off. 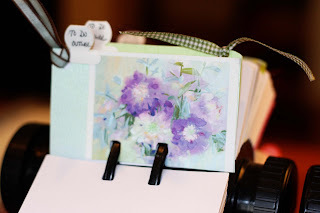 Hooray for paper organizers! Great idea! You blog continues to inspire me!!! Thanks!